If someone sent me email with attachments, I like to save them in mail server because it saves my computer space, if I needed I can download them any time. But the problem is, my mail server keeps hundreds attachments, how can I download them at once? Mail Downloader is a free software, it lets you only download attachments without bother mail content. It supports multiple mail servers, like Gmail, Hotmail/Live, Yahoo Mail, AOL, and other pop3/imap mail servers. If this application is running it can make schedule download attachments automatically. I only concern about privacy, the official website says, it can be download attachments securely by encrypted channels, your email username, password, and email information only store in your computer. 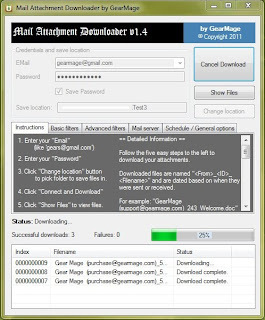 Direct download Mail Downloader here.